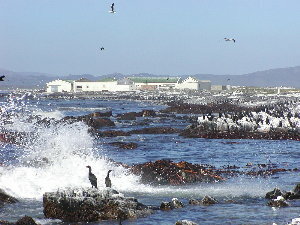 Dyer Island is a small island, offshore from Gansbaai in the Western Cape. Bruce Dyer, John Cooper and myself visited the island to trap Leach's Storm Petrels, if possible. 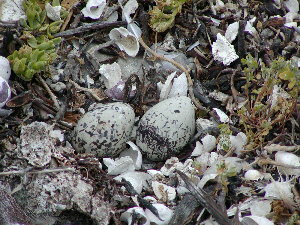 Read more about Dyer Island, adjacent Geyser Island, and Leach's Storm Petrels. Photo H.D. Oschadleus View of the houses on Dyer Islnad. Tony Venter lives here to manage the island. Photo H.D. 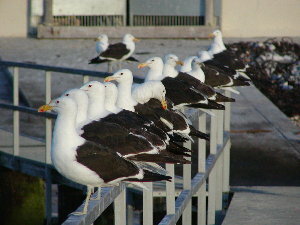 Oschadleus Welcoming committee of Kelp Gulls. Photo H.D. 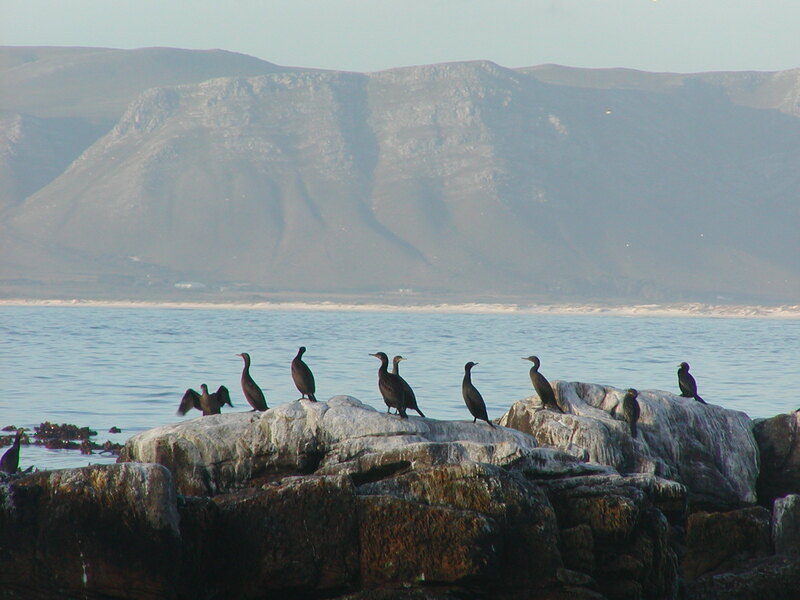 Oschadleus Cape Cormorants on the rocks. In the background is the mainland. Photo H.D. 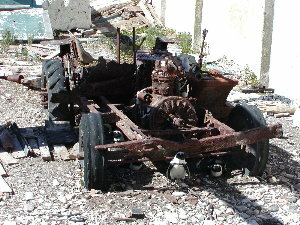 Oschadleus "African Penguins having driving lessons", was John's comment. Photo H.D. Oschadleus Turnstone foraging. 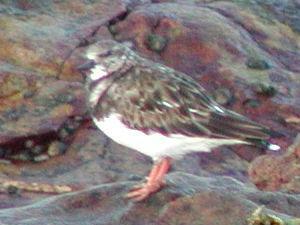 A migrant, found mainly on rocky shores. Photo H.D. Oschadleus Common Tern flock with a few Sandwich and Swift Terns. 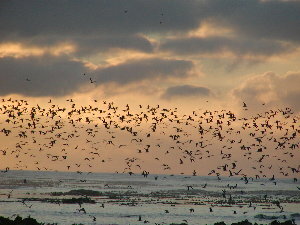 There were several thousand roosting on the rocks. Photo H.D. Oschadleus I put up mistnets in the early afternoon to catch some resident birds. 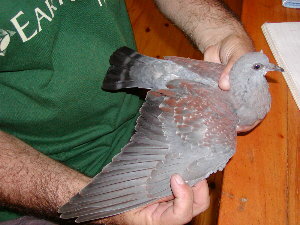 Several Rock Pigeons, including this immature bird, were ringed as was a House Sparrow. At least two cormorants flew into the nets but got out before we could reach the nets (and before damaging the nets!). 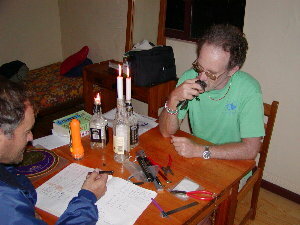 John caught some of the Rock Pigeons by hand after dark using a torch. Photo H.D. Oschadleus At midnight we went out for our regular check of the nets and heard the Leach's Storm Petrels calling. One was caught in the nets, much to our delight. We did not catch any more, although one flew into me (I was too surprised to grab it and it was rather dark so I didn't see it coming). Bruce counted about 3 birds calling. Photo H.D. 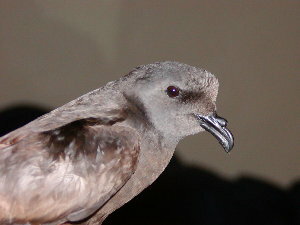 Oschadleus Closeup of the Leach's Storm Petrel. The lighter colouring on the wing is due to the candle light held close to the bird so that I could focus correctly. Photo H.D. Oschadleus The next morning I walked around the island with Tony Venter and his assistant, Natasha, to survey the African Black Oystercatchers. Two is the usual clutch size. Photo H.D. 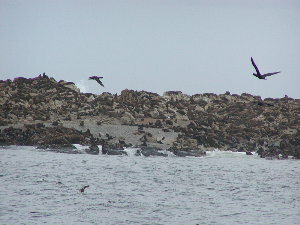 Oschadleus Next to Dyer Island is the smaller seal covered Geyser Island.